The exhibit’s signature piece, “ISWASWILLBE, 2000,” at The Art Gallery in the Fulginiti Pavilion for Bioethics and Humanities. How do you talk about the Holocaust in a way that has not been done before? How do you transcend the now-too-familiar images in literature, film and art of emaciated concentration camp victims, stony-looking Nazi soldiers and cattle cars jam-packed with Jewish families being transported to unspeakable horrors? 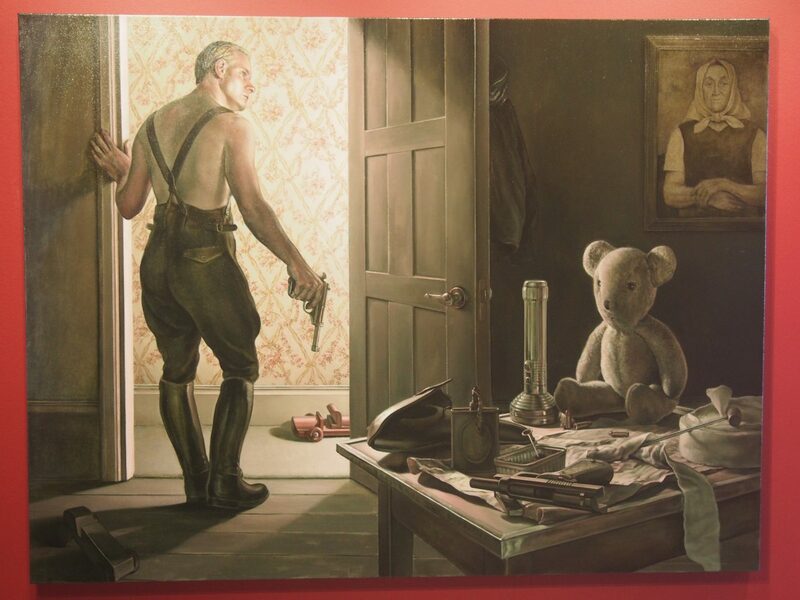 As the child of Holocaust survivors, artist Geoffrey Laurence felt compelled to create a response in painting to his feelings toward this horrific piece of history and, therefore, was forced to ask himself these questions. 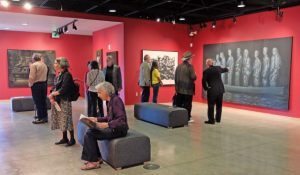 His 20-year effort to paint “what is inexplicable in words” is on display at The Art Gallery in the University of Colorado’s Fulginiti Pavilion for Bioethics and Humanities on the Anschutz Medical Campus. 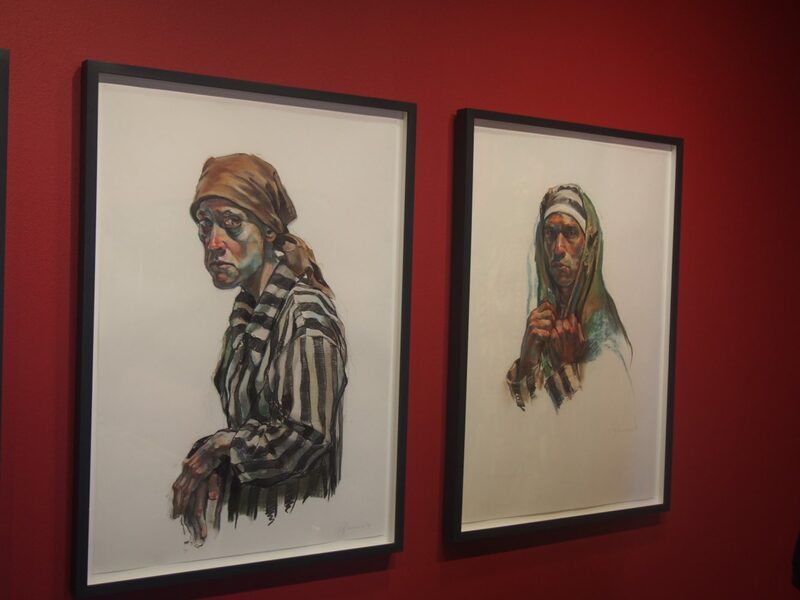 The “ISWASWILLBE” exhibit, which opened April 3, includes eight of 10 pieces that are part of Laurence’s Holocaust Series. They are riveting and haunting, and anything but commonplace. All the paintings in the series started with a single thought – from either a book, a photograph, a memory, or a concept, and then evolved into complex stories on canvas. The stories have a common purpose. His signature piece, “ISWASWILLBE,” was one thought and then another. 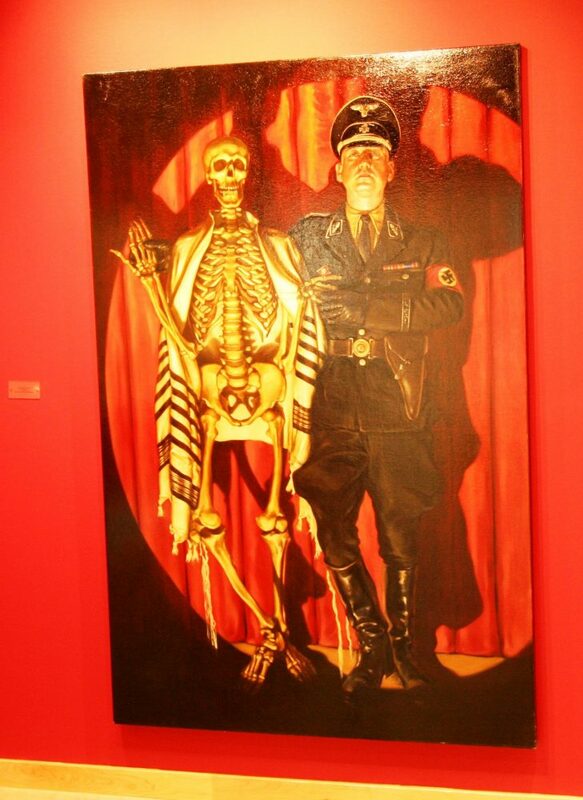 They came together as inspiration for a painting of a Nazi soldier in full uniform with his arm draped around a skeleton wrapped in a tallit (a Jewish prayer shawl), center stage with a spotlight encircling the pair. “Nightgames, 2012” shows the disconnect between a Nazi soldier’s home and work. 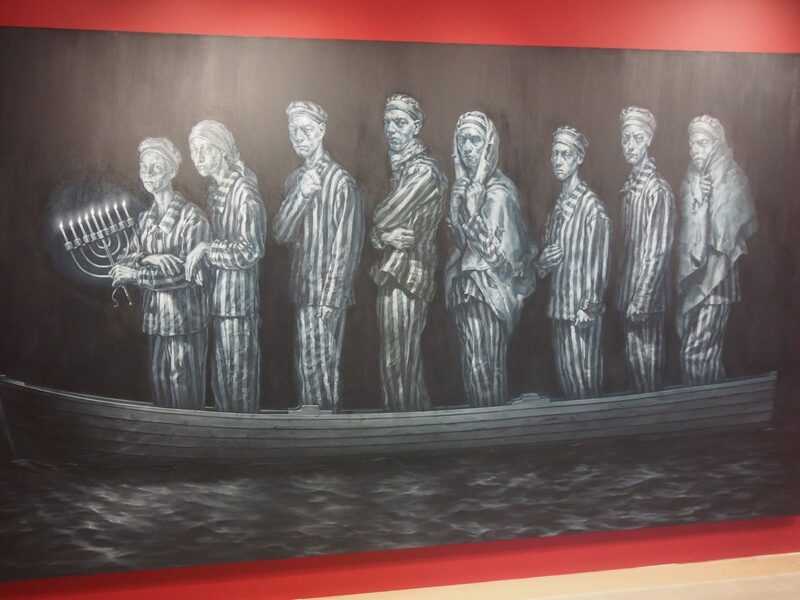 In “Those the River Keeps,” eight concentration camp victims are afloat on a wooden boat with a lit menorah to guide their way. Although Laurence says these eight people represent his family, he admits he has never seen photos of them. Although Laurence’s parents were Holocaust survivors, his father having been at Dachau before he was freed, they did not speak about their experiences with Laurence – at all – while he was growing up. In fact, Laurence did not know for certain that he was Jewish until he was 46. Once his mother confirmed his long-held suspicion, Laurence became obsessed with learning about the Jewish faith, traditions and rituals. It was soon after he learned that he was Jewish that he began to work on what would become his Holocaust series. Although gallery owners and collectors discouraged him from working on such a macabre subject, saying that no one would show the pieces or buy them, Laurence felt “he had to paint it,” if only for himself. Artist Geoffrey Laurence (left) talks with Simon Zalkind, curator for The Art Gallery, on the opening night of Laurence’s exhibit. Painting since he was three, Laurence earned a bachelor’s degree in Art from St. Martin’s School of Art in London and a Master of Fine Arts from the New York Academy of Art. He says he likes to marry the style of classical realism with modern painting – but is not a fan of more contemporary styles, such as installation art, video art or conceptual art. While his oil-on-canvas paintings have a classical quality, reminiscent of the old masters he loves, such as Rembrandt and van Dyck, he says his compression of space makes his images more contemporary. The April 3 opening of ISWASWILLBE at the Fulginiti Gallery. Exhibit curator Simon Zalkind interviewed Laurence on the exhibit’s opening night, discussing the artist’s inspiration for each painting, his influences and their common histories. Zalkind is also the child of Holocaust survivors. 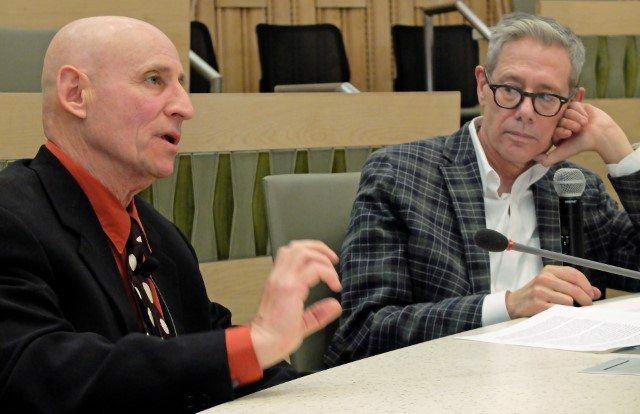 The two compared notes of what it was like to be what they call second-generation Holocaust survivors. Joelle Klein is a Denver-area freelance writer who specializes in health and wellness issues.